Gardeners are a resourceful bunch, making the most of what's to hand and taking the time to get more from less. Perhaps it's because patience is such an integral part of what we do – after all, even the quickest vegetables still take weeks from sowing to harvest. Recycling waste in the garden certainly gives me a great sense of satisfaction. The fact that I've rescued something destined for oblivion and turned it to practical use while saving a little money in the process is immensely gratifying. And it's easy! All that's needed is a raid of the recycling pile for easy-to-convert pots, seed trays and more. Seed sowing is a great place for recycling-in-the-garden newbies to start. Many repurposed containers can be used immediately, while others require just a few tweaks before they are ready for sowing into. You can also get creative by painting or accessorizing chosen containers to look fabulous and funky – bespoke containers as extrovert as you care to make them! Old yogurt pots are the ideal size for sowing small clusters of seeds or larger seeds individually. Before using them you will need to punch some drainage holes into the bottom. I use a sharpened kebab skewer for this purpose, pinning the pot down and needling the holes through the bottom as I twist. You could also use a power drill, holding the pot onto a supporting stump or wood block as you drill. Fruit punnets – the types that raspberries and other soft fruits are often sold in – make excellent miniature seed trays. Many already have holes in the base, allowing a quick turnaround for sowing. Clear plastic trays also make handy miniature greenhouses or sprouting trays. Toilet roll tubes give extra root depth, which is ideal for deeper-rooted vegetables such as peas, beans and corn. Pack them into a supporting tray, cheek by jowl, so that the sides remain intact and don't collapse when saturated. The great thing about toilet roll tubes is that they can be planted out as they are – the cardboard simply rots away. Old polystyrene drinks cups – the sort hot drinks are served in – make excellent pots for young plants. They are a decent size and the polystyrene helps to insulate the roots against cold. Create drainage holes by pinching three or four holes into the base of the cups at the sides. Even your daily read can be reinvented for sowing. Paper pot makers – also known as paper potters – can turn newspapers into handy little propagation pots in seconds. But you can do without if you're not planning on production-line quantities. Simply fold a page in half lengthways then roll it around a toilet roll tube so that the tube sticks out above the folded edge of the paper; this will be the rim of your pot. Now gather up the loose ends of the paper at the bottom and push them into the base of the tube to form the bottom of your pot. Slide out the toilet roll tube then flatten out the base of your pot by simply filling it with compost/potting soil ready for sowing. Just like sowing into toilet roll tubes, I sit them side-by-side within a tray so that they are supported and can't fall apart. How often have you sown your seeds, watched them germinate then forgotten which seedlings were which? This has happened to me on more than one occasion! 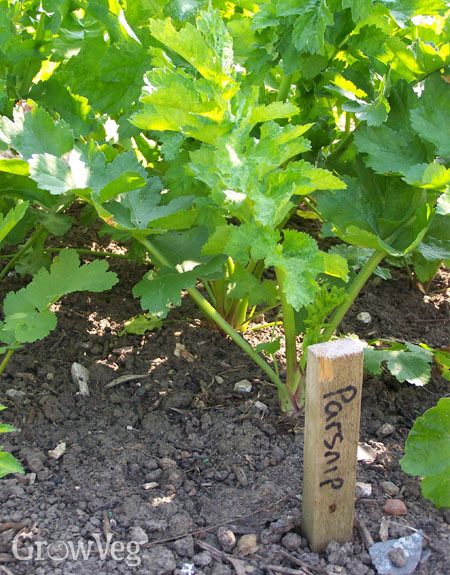 The solution, of course, is to label everything – and I mean everything – with the variety of the crop and the sowing date. Make your own plant labels by cutting out strips of white yoghurt pot or repurposing wooden lollipop/ice cream sticks. Write onto plastic labels with a marker pen. Seeds sown directly into the ground can be labeled using lengths of wooden batten, cut into foot-long sections then pushed into the ground. If you have the time, inch-wide prunings shaved to expose a flat, writable surface, make for an incredibly attractive semi-permanent solution. Germination can be greatly improved with the addition of a little warmth. Any clear plastic or glass cover can help to trap the sun's heat and create a greenhouse effect, warming the soil and coaxing seeds from their slumber. This includes, for example, old panes of glass placed over seed trays, or clear plastic drinks bottles cut in half to make miniature hot houses that can then be popped over individual plants or pots of seedlings. Simple yet very effective. Another handy tip to help your seedlings along is to use reflectors to bounce back light. This is particularly useful for windowsill seedlings, which inevitably lean towards the light, necessitating regular turning of the seed tray to balance out the growth. Make a reflector by wrapping a suitable vertical surface with aluminum foil, shiny side facing outwards. Place this opposite the window to reflect back some of the light and reduce the leaning effect. You could even line an open-sided cardboard box this way to create a self-contained natural light chamber. Recycling for seed sowing merely requires a little imagination. See how much you can save on your spring sowing shopping bill! And please share your own ideas for seed-sowing recycling below. "I am using storage containers to grow my fruits and vegetables. I have five 36 5/8 X 21 X19.5, I have two 39 3/4 X 21.5 X 17 and three 26 X 16. How would I set this up in the garden planner "
"Hi Roosevelt. To do this simply select any of the container options from the selection bar - I guess you'd want to select a container that reflects the shape and colour of your storage containers. You can then click to select and drop into place on your plan. Use the corner handles (the little squares in the corners) once you've dropped the container into place to change the shape and dimensions of the container to accurately reflect the dimensions of your storage containers." "How can I monkey (vervet) proof my vegetables shooting the blighters is not an option. Greg"
"Hi Greg. That's a tricky one as we don't have monkeys where I garden! You could try growing vegetables within fruit cages, or perhaps protect particularly vulnerable plants under hoop houses/tunnels with netting draped over the top?" "I am using toilet roll tubes to grow carrots. I leave them the full size, so that the roots grow long and straight. Last year I had a good crop from my stony garden, but all forked!ann "
"Growing like that is a good idea Ann. I wouldn't worry too much about forked carrots though - I'm sure they still tasted amazing!"